Dato’ Abdullah Mohd Yusof, was born to a well-established Johore family. His father was a Civil Servant in the Johore Courts. His mother was a School Teacher and retired as a Principal and Inspector of Schools. He attended the Johore English College and then went to Singapore to read Law at the University of Singapore. He graduated with a Law Degree (Honours) in 1968. He practised Law for 50 years until his untimely passing on 25 April 2018, a few days before his 79th birthday. He was a successful Lawyer. He had his own legal practice in Kuala Lumpur and was a founding partner of Abdullah & Zainudin. He was in the forefront of the government’s efforts to increase Bumiputra participation in the private sector and was also entrusted with the responsibility to promote Malaysia – Japan business partnerships, particularly in the retail sector. 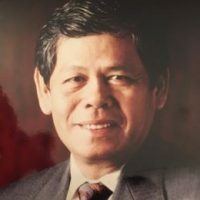 Dato’ Abdullah Mohd Yusof, served as Chairman of Jaya Jusco Stores and later AEON Co. (M) Berhad since 1984. He was also Chairman of AEON Credit Service (M) Berhad in Malaysia since the Company’s inception in 1997. In addition to AEON, he served on numerous boards including Chairman of New Straits Times, UEP Subang Jaya, Faber, Ranbaxy Pharmaceuticals, People ‘n Rich and Hay Management. He was also active in the hospitality industry and was the Chairman of Shangri-la, Hyatt, Sheraton and Intercontinental during the developmental and start up phases of these hotels in Malaysia. At the time of his passing, he was also on the Board of MMC – Malaysian Mining Corporation Berhad. Dato’ Abdullah made an immediate impact on the people in the many companies he was involved with. He was the antithesis of the usual corporate type. He was unfailingly polite, helpful, charming and comfortable in any social circle. Dato’ Abdullah was the first Trustee of the Japan Club of Kuala Lumpur, a charitable foundation. All the proceeds raised from an ‘Annual Charity Bazaar’ were fully donated to various charitable organisations in the country. “Malaysians have warmly welcomed many of our compatriots, who have exhibited diligence in working with Malaysians, and have participated in the industrial development, through which the friendship of both citizens has been fostered year after year. Dato’ Abdullah dedicated so much time and energy for such amicable inter-actions between Malaysians and Japanese, generating partnerships in this country for many years. I conceived an admiration for his inflexible sense of duty, and I felt the utmost confidence in his compassionate and charming character and outlook on his responsibility”. “Jaya Jusco Stores Sdn Bhd (currently AEON Co. Malaysia Bhd) was established 34 years ago. Dato’ Abdullah was appointed as its Chairman. He also contributed to the expansion of AEON group. AEON’s immense achievements in Malaysia since its establishment should be duly ascribed to Dato’ Abdullah. His sense of duty, his understanding of our nation, Japan, our people and our virtues and values were always evident, but added to these was the spirit of harmonisation with us. He was one of the greatest friends of Japan we have ever known. He will stay warmly alive in our memory as a real bridge between the two nations and two people”. “It was Dato’ Abdullah who guided the Company out of the dark days. He supported the AEON business and was at the forefront in creating the Company’s long and bright history in Malaysia. In fact, his achievements are the very history of AEON and the pride of the people and AEON”. “as a pioneer who had matured AEON Malaysian to becoming the success it is today”. “Dato’ Abdullah Yusof marched to his own beat. And in a world so easily taken by form and distasteful shows of wealth, Dato’ Abdullah showed poise and balance. Inspite of his many responsibilities, Dato’ Abdullah was well read, articulate, gracious and welcoming to all – rich and poor, young and old. Even in the toughest of times Dato’ Abdullah kept his composure and his many anxieties to himself. In Japan, they would describe such a person as 1K1, which means someone who is original, calm, refined and sophisticated without being too perfect, complicated or self-conscious. Dato’ Abdullah thoroughly enjoyed interacting with people and always demonstrated concern and care for the welfare of his family and friends. He was a man of faith, but not taken up by rituals. He had a profound understanding of the essence of his faith and that of others. He however, never cared to impose his views on any of his many friends of different races and religions. He was a free man of faith. Dato’ Abdullah loved his friends, and even more he loved life. Travelling and golf with his eclectic choice of friends became one of his great joys in the last few years. Coming from Johore, Dato’ Abdullah was an ardent Anglophile, but in spite of this he was quick to appreciate the best in every cutline that he encountered”.